If you use Facebook’s Marketplace feature and you are still able to login to Facebook today (4/26/17) you are one of the lucky ones. 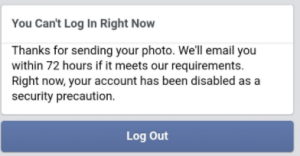 Shortly after midnight EST Facebook users started reporting on Twitter that their accounts had been disabled for 72 hours without much explanation as to why other than Facebook had noticed suspicious activity on the account and requested the users submit a picture of themselves to verify their identity. After users would submit a picture the message below would show up. A common thread in all of this points to Facebook’s Marketplace feature. The Marketplace feature is a place where users and post items for sale or trade with other Facebook users in their local area. What appears to be causing the account disable is when users are either posting new items to the marketplace, editing items in the marketplace, or renewing or “bumping” the listings back up to the top of the marketplace list. Once the user creates or makes the changes Facebook pops up stating that there is an issue with the account, requesting the photo, then states the account has been disabled. As of this posting Facebook has not commented on the situation, how they plan to resolve it, or the link to the disabling accounts and the Facebook Marketplace. In the meantime Facebook users are left wishing, hoping, and praying that this issue will resolve itself as quickly as it began. We all hope that we don’t have to wait the full 72 hours, or longer. Tech Crunch reports that Netflix now supports offline viewing on Windows 10 devices. The only exception to the rule is Windows 10 mobile devices. To take advantage of this feature you must download the free Netflix app from the Microsoft App Store and be running Windows 10. The only catch is not all content on Netflix is available for download, just Netflix original content and certain movies and television shows that Netflix has an agreement that allows offline viewing. Note: There are a few reports from early adopters that downloads are not working properly for them. When they try to download content they’re getting a “download error” message saying “there was a problem.” Netflix says it’s looking into this problem. Apple this morning released some new products and didn’t make a big deal about it. Apple is famous for holding live keynotes and stream the keynotes online whenever new products are coming out but this time Apple did just the opposite by inviting just a few news outlets, and quietly adding the items to the site. What did Apple release you ask? Here is the list. The flagship model of Apple’s iPad has a new look. Apple isn’t giving this model a generation number, it’s just saying iPad, flat-out fun. Here are the specs of the new iPad. The RED Edition of the iPhone only comes in the 128GB and 256GB options, not the 64GB option. There is nothing different on this phone other than the color. If you purchase a Red Edition iPhone Apple contributes to the (RED) HIV/AIDS Program. While Apple isn’t doing away with the iPhone SE, it is however getting rid of the 16GB and 64GB models. Taking the place of these are the 32GB and 128GB storage models. The starting price is still $399 but the more expensive model has bumped up from $449 to $499. Apple’s newest app is called Clips, a mix of Snapchat and iMovie. The app allows you to create photos or short videos, or import them from your Photos app, add special filters and effects before sharing them online. A few new Apple Watch bands were introduced. The new options include a new striped woven nylon, Nike Sport, and Apple Watch Hermès Bands. Apple introduced six new colors for iPhone 7 and 7 Plus cases. The new color options for the silicone models include Azure, Camelia, and Pebble. For the leather options, the new colors include Berry, Taupe, and Pebble. Tech Crunch reports Facebook has added a feature that allows users to find and follow as well as contact their government representatives. The new Facebook feature can be found under the Apps section of the Facebook mobile app. You just click Town Hall, use your location or type your address,and Facebook populates a list of your local, state, and federal officials, all the way up to the President. The only drawback to this feature is the Contact button feature. Under this feature when you click it, depending on the person, that button may allow you to email the representative, Facebook message them, or just visit their Facebook page. Now that this feature is available this may cause the representatives to take a more uniformed approach and make the button perform the same action on all accounts. Tech Crunch reports that Spotify and the popular GPS travel app Waze have partnered to combine the two things most people do in their vehicles, use GPS and listen to music. This partnership allows Waze users to listen to Spotify playlists while travelling and allows Spotify users to continue to get their Waze updates while inside the Spotify app. The partnership will allow users to switch between the apps or allow you to scroll through your Spotify playlist, ONLY if the vehicle is at a complete stop. Plans are to roll this new feature out to Android first, but no word yet as to when it will make its way to iOS. For those of you wondering how this will work here is what you will see. Users who are in the Spotify app will now get a short version of the next navigation instruction, while Waze users will get a short description of what they’re listening to, with the option to skip or change the music without needing to open the Spotify app. For Waze and Spotify this is exciting news since this could grow both brands exposing their services to customer who had not used them before. For companies like Pandora and Slacker will they jump on the bandwagon and offer their services to Waze, or will they back a different GPS solution, or ignore this opportunity completely? Engadget reports that Google Pixel and Google Pixel XL customers are reporting mic issues on their devices. Google has confirmed that after hundreds of complaints from customers that there is an issue with the microphones that require a warranty replacement. Owners have reported issues in one or more of the three mics built into the phone causing either intermittent audio input issues, no audio input at all, or failure of the camera apps audio recording function. Google is pointing to a hairline crack in the solder and the culprit to the issue. Once you contact Google and they begin the return process it will begin with Google shipping you a replacement phone. Once they ship the device a hold on your credit card will be placed for the total of the phone, and the hold will be released once they receive your old phone. Google started reinforcing the connections in the phones back in January so the recent phones should be okay. NBC News reports that YouTube has announced that YouTube is going to start offering a live and on demand television service called “YouTubeTV”. The service will cost $35 a month with access up to six accounts. The service is scheduled to go live in the next few months in the US, but no plans at this time for international distribution. Subscribers will have access to up to 40 cable channels plus YouTube’s premium video service YouTube Red. Some of the channels included are NBC, Freeform, FX, ESPN, Fox Sports, and NBC Sports. Showtime and soccer programming will be available as well, but for an additional fee. This is great news for cord cutters as this is another option for premium programming is becoming available. Now that Sling and Playstation have their options for online streaming channels expect more companies to jump on the bandwagon very soon. According to the USA Today, Facebook has announced that it will begin paying users who use the Facebook “Live” video broadcasting service. While it is easy to go live on Facebook, getting paid isn’t as easy. If you want to get paid to broadcast on Facebook here are the requirements. Broadcasters must have at least 2,000 followers and can get at least 300 viewers to watch one of the broadcasts concurrently. If you can meet the following criteria Facebook will pay you 55% of the ad revenue of your broadcast. To sign up to get paid for your broadcast Facebook will send you an invite via notifications. Once you sign up, when you go live a $ icon will show up. The first ad will broadcast approximately 4 minutes into your broadcast and the second ad will come 5 minutes later. This new strategy from Facebook is to be in competition with YouTube for users and video content. YouTube has been the industry standard for video content for several years, now Facebook is wanting their piece of the pie. The Wall Street Journal reports Waze, the GPS app owned by Google, has plans in the works on expanding its carpool a.k.a. ride sharing service. Google has been testing the carpool service in Israel, where Waze was originally founded, and in San Francisco and have been pleased with the results. Google plans to expand the service across the U.S. as well as Latin America over the next several months. Waze service is taking a different approach than Uber and Lyft, but still using the same principle, users helping users. Uber and Lyft made their mark as providing transportation to users similar to taxi cab services, while Waze is looking into providing more of a carpool approach rather than a taxi service. Uber and Lyft have recently started offering carpool services, their main focus is still on the taxi services. Now that Waze is looking into offering carpool services this could change how Uber and Lyft handle carpooling. Waze has made its success by allowing its community to interact with one another through map updates like road hazards, weather conditions, and even that police car hiding behind the bush. If the Waze carpool works as well as their GPS software, Uber and Lyft may be seeing a fast competitor approaching in their rear view mirrors.